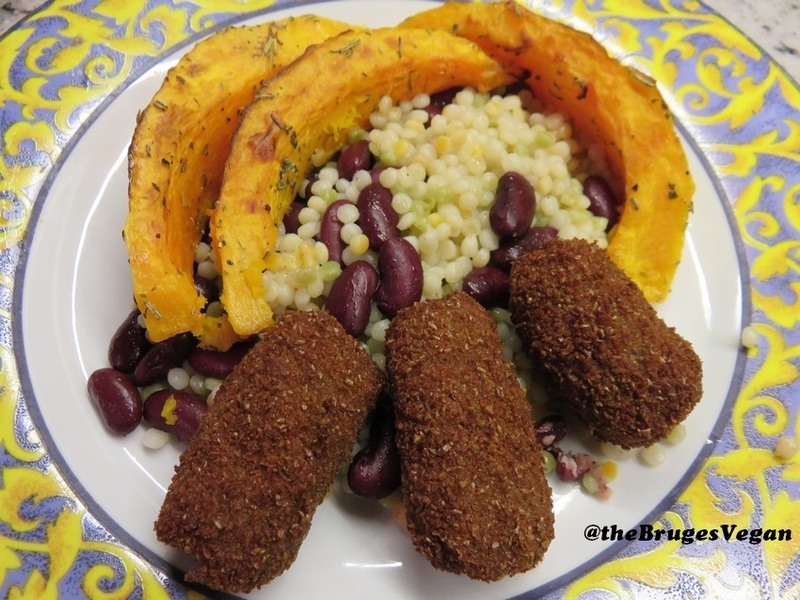 These tofu croquettes are from Abinda, a company making organic vegetarian products, located no so far from Bruges in Oostkamp. I visited their factory in 2011, you can see a review from that visit on my Dutch blog here. Many of Abinda’s products are vegan. Their products are commonly sold in organic shops across Belgium. You can see the ingredients of the tofu croquettes here. Preparation of the tofucroquetes is very easy, just fry them for a couple of minutes and they are ready. These tofu croquettes are nice and crunchy, but I would like them to be a bit more creamy on the inside to make them even better. This time I served them with pearl couscous, azuki beans and uchiki kuri pumpkin from my garden topped with Mediterranean spices! A lovely tasty meal! I love these tofu croquettes too!